Open-angle glaucoma threatens the sight of more than 50 million people worldwide, with the number of annual cases significantly on the rise. This means glaucoma patients are an increasingly important part of any practice. Lumenis offers an array of ophthalmic laser systems that continue to provide the ophthalmologist with essential surgical tools to help lower intraocular pressure and control this progressive, degenerative disease. A minimally invasive technological breakthrough, the Selecta II glaucoma laser system is changing the future vision of glaucoma patients with Selective Laser Trabeculoplasty (SLT). SLT provides the benefits of Argon Laser Trabeculoplasty (ALT) without the coagulative damage that leads to scarring. From photocoagulators to photodisruptors, Lumenis’ family of advanced laser technologies are an invaluable mainstay in the treatment of glaucoma. How & Why It Works? Since Selective Laser Trabeculoplasty depends on the laser parameters for targeting the pigmented cells, it is not necessary to have a small spot size or to precisely target a site in the trabecular meshwork as compared to traditional Argon Laser Trabeculoplasty. For SLT a large 400 micron spot is directed into the angle using a specially developed gonio lens to minimize beam distortion and provide good visualization of the angle. Unlike ALT, focus is not critical since the large spot has a greater depth of focus than the 50 micron ALT spot. A red aiming beam the same size as the treatment beam shows the area to be treated. 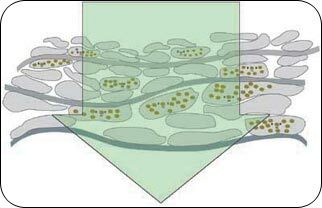 Selective Photothermalysis determines which cells are targeted and activated. During treatment there is normally no observable tissue reaction. Due to variations in pigmentation the laser energy is normally adjusted to a level just below that where a minimally observable effect is achieved. How does SLT achieve lower pressure without damage to the trabecular meshwork? The underlying mechanism is selective photothermalysis that enables the laser to precisely target intracellular melanin granules to activate individual cells while not disturbing adjacent non-pigmented cells. The activated cells release cytokines that trigger a targeted macrophage response to the trabecular meshwork cells. The macrophages reactivate the meshwork reducing fluid outflow resistance and lowering intraocular pressure. For SLT the light energy is provided by a specially designed Q-switched, frequency doubled Nd:YAG laser operating at 532nm green with an output of from 0.3 to 1.5 millijoules. The target tissue is melanin granules within individual trabecular meshwork cells. Based on the size of the pigment granules, it is necessary to deliver the light energy within 1 microsecond. The Q switched laser pulse width is 3 nanoseconds, well within the required time interval to contain the energy and temperature rise to the pigment granules. Mark Latina, M.D. inventor of SLT did cell culture and animal experiments to determine the specific energy range for selective cell damage. (Click here for Latina paper) Through his investigation parameters were determined which would activate certain pigment containing meshwork cells while sparing immediately adjacent non-pigmented cells. Further human studies showed the pressure lowering effects of Selective Laser Trabeculoplasty without observable damage to the trabecular meshwork cells. Fluorescent live/dead assay reveals that only melanin-laden trabecular meshwork cells are affected, as seen with red nuclear staining. Selective Laser Trabeculoplasty is an improvement over conventional ALT by eliminating thermal damage of the trabecular meshwork architecture. Using a low-energy, Q-switched, frequency doubled Nd:YAG laser emitting at 532 nm with a pulse duration of 3 nanoseconds, researchers demonstrated isolated destruction of the pigmented TM cells without thermal or collateral damage to the surrounding non-pigmented cells and trabecular collagen beams. Further, endothelial membrane formation on the TM, usually found in ALT-treated eyes, was not observed after SLT exposure in vivo. SLT is safe and effective, and is not associated with systemic adverse effects. 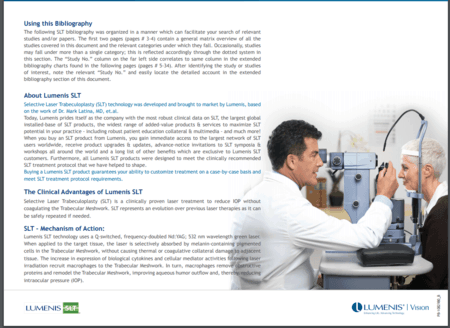 SLT provides economic benefits for the patient and the physician. Laser trabeculoplasty is a Medicare covered procedure and is typically reimbursed when medically necessary under CPT code 65855. Preoperatively, careful goinoscopy should be done to visualize the trabecular meshwork and plan the treatment area.Preoperative medications consists of a drop each of lopidine or Alphagan and topical anesthesia. A SLT laser gonio or zero magnification lens is placed on the eye with methylcellulose. The aiming beam is focused onto the pigmented trabecular meshwork. Treatment is done in single-burst mode, placing 50 ± 5 contiguous, but not overlapping, 400-micrometer laser spots along 180 degrees. Bubble formation is monitored with each pulse. In cases with significant variation in trabecular pigmentation, the pulse energy is decreased if bubble formation occurred as described above. After laser treatment, prednisolone acetate 1% is administered and continued n the treated eye four times daily for four to seven days. Mark A. Latina, MDreview of two studies that hold important implications for SLT treatment. Karim F. Damji, MDResearch indicates that SLT appears to be equivalent to ALT in lowering IOP at all time points.